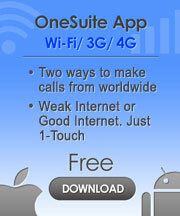 Hassle-free telecom expense management web tool for businesses and groups to manage multiple OneSuite user accounts. Prepaid telecom services. No contracts! Then, pay as you go! Immediately begin setting up employee sub-accounts so they can start enjoying all the convenient telecom services under One Suite. Check out the rest of OneSuite’s low rates for internet fax, VoIP and international call forwarding, available by subscription in your employees’ sub-accounts.